Three Musketeers made a winning debut for Irish trainer Gordon Elliott with success in the opening race on day two, Ladies Day, of the Randox Health Grand National Festival.Ridden by Jack Kennedy, the nine-year-old son of Flemensfirth was backed into 8/1 from 14/1 just before the off. He took up the lead in the closing stages of the two mile and four furlong event and registered a length and three-quarter success over the Tim Vaughan-trained Point Of Principle (25/1) in second. Three Musketeers was previously trained in England by Dan Skelton and Elliott paid tribute to the gelding's former handler, who suggested the horse should move to Elliott's Cullentra Stables in County Meath. Elliott said: "Three Musketeers has been with me a couple of months now. In fairness to Dan Skelton, he recommended that the owner send him over to me - he just thought the horse had gone a bit shady. A big thanks has to go to him. "Three Musketeers had been working well at home [in cheekpieces] so we said we could keep them on. "It was nice to win today. He is my first horse for the owners, who are from Liverpool originally. I was worried we might be going a step too high, but Jack gave him a great ride. "Three Musketeers could be a nice horse for something like the Galway Plate. We're happy to go back over fences with him." Elliott has 13 runners in tomorrow's Randox Health Grand National including the favourite Tiger Roll, who bids to emulate Red Rum, (1973, 1974 and 1977) by winning multiple renewals of the £1-million event. "The way he won the [G2] Boyne Hurdle and at Cheltenham [Glenfarclas Cross Country Chase] suggests he's better than ever and we're very lucky to have him. His form looks better than ever, but this is his toughest test of the season. "It's the Grand National and I'm under no illusions, but if he wins it will be a great story. Since Cheltenham we've just tipped away with him - that was the main target, but the National was in our thoughts, too." Jockey Jack Kennedy rode his first winner at this year's Randox Health Grand National Festival when Three Musketeers landed the Merseyrail Handicap Hurdle. The nine-year-old was making his debut for trainer Gordon Elliott, having previously been in the stable of Dan Skelton. It would be fair to say Three Musketeers's form was proving disappointing, and so it was decided to give him a change of scene. Kennedy, who rides Dounikos for Elliott in tomorrow's Randox Health Grand National, said: "That was another great training performance by Gordon, although he wasn't a bad horse when at the Skeltons. He just lost his way a bit, but Gordon seems to be good at getting them back to their old form. "Gordon's instructions beforehand were to be behind the leaders and not to go too wide on him. It kind of all worked out the way we wanted it to, so it was great. "They went a really strong gallop and he was a little bit behind the bridle the whole way, but I knew he would stay going and I was confident I would pick them off in the home straight. "The ground is soft at the moment but I think, with the drying, it could end up a bit tacky. It's not all heavy, it's just soft at the moment, and there is plenty of dry in there today, so it will be drying out the whole time." Of his ride on Dounikos, Kennedy said: "It's very exciting, and if he takes to it and puts in a clear round he should run well. He handles the mud and stays so he's a nice ride to have." Kennedy was subsequently given a four-day ban by the stewards for excessive use of the whip. Conditional rider Charlie Price enjoyed a thrilling first ride at Aintree on 25/1 chance Point Of Principle in the opening race of day two, but he was left gutted when well-backed Irish challenger Three Musketeers (8/1) swept by near the finish and beat him a length and three-quarters. The 7-lb claimer said: "I thought I had the race won, but when I asked him to come up at the last he just put down on me and then he was just idling I think on the run-in. It was a big thrill all the same." Trainer Tim Vaughan added: "We are all a bit disappointed, as we don't like finishing second, but he's run a smashing race. He's hardly ever out of the first four and is very consistent." Dermot McLoughlin, trainer of third-placed Canardier (6/1), said: "We were very pleased with him. At the start of the day we were considering not running him if the ground was any worse than it was yesterday, but Barry [Geraghty, who rode Canardier] said though it is a bit patchy, it will ride well enough. "Since he won at Cheltenham in October he hasn't had the ground. At the Cheltenham Festival the ground was a bit dead, the same as today, but he ran a great race - he just wants real good ground. We'll go to Punchestown for a good two and a half-mile handicap hurdle, and hopefully he'll get his ground." Jack Kennedy, partner of 8/1 chance and winner Three Musketeers, said: "Soft - it could end up being tacky." Charlie Price, rider of the one and three quarter-length second Point Of Principle (25/1), said: "It is a bit soft." Barry Geraghty, partner of the third Canardier (6/1), said: "It is softish." Richard Johnson, partner of the fourth Sternrubin, said: "It is a mixture of soft and good - the fresher ground is good. It is drying and will be very tiring." Bridget Andrews, partner of Mohaayed, said: "Soft." Nico de Boinville, on board Kobrouk, said: "Very dead." Lee Edwards, on board Mister Fizz, said: "It is soft and quite gluey." Lorcan Williams, rider of Mont Des Avaloirs, said: "It is a bit tacky." Harry Skelton, partner of Knight In Dubai, said: "Slow." Mark Walsh, partner of Project Bluebook, said: "Tacky." Tom O'Brien, on board Push The Tempo, said: "Dead." Danny Cook, jockey of Joke Dancer, said: "It is on the soft side and a little bit dead." Adam Wedge, jockey of Esprit Du Large, said: "It is good to soft and drying out - lovely ground." Nick Scholfield, on board Tedham, said: "Good to soft - soft." Leighton Aspell, partner of Admiral Barratry, said: "Soft." Jeremiah McGrath, jockey of Caltex, said: "Dead." Jonathan Burke, on board Doctor Dex, said: "Yielding." Alan Johns, partner of Landsman, said: "Dead." Betway, official betting partner of the Randox Health Grand National Festival, have pushed the Gordon Elliott-trained Tiger Roll out to 9/2 favourite from 4/1 ahead of tomorrow's £1-million Randox Health Grand National at Aintree. Tiger Roll (Davy Russell, 11st 10lb), bidding to become the first horse since Red Rum (1973, 1974 & 1977) to win multiple renewals of the four and a quarter-mile event, is still a clear favourite, but due to a number of horses attracting each-way support, Betway are keen to take on the nine-year-old son of Authorized, who will carry 9lbs more in this year's renewal, compared to 2018. Heading the dangers is the Willie Mullins-trained Rathvinden (10/1, 11st), who returned to action with a comfortable success in the G3 Bobbyjo Chase at Fairyhouse in Febraury and is officially 8lb well-in. He will be partnered by Ruby Walsh. At bigger prices, the David Pipe-trained Ramses De Teillee (David Noonan, 10st 9lb) is bidding to provide the Nicholashayne handler with a second success in the four and a quarter-mile event following Comply Or Die's 2008 win. The seven-year-old son of Martaline is a 20/1 shot from 22/1 with Betway. Mark Bradstock has tasted big-race success with 2015 G1 Magners Cheltenham Gold Cup scorer Coneygree and he runs 2018 bet365 Gold Cup winner Step Back (Nico de Boinville, 10st 7lb), who has also attracted each-way support, constricting in price to 22/1 from 25/1. Elsewhere, the two big drifters in the race are American Grand National winner Jury Duty (Gordon Elliott/Robbie Power, 10st 11lb), a 18/1 chance from 16/1 with Betway and 2017 Randox Health Grand National winner One For Arthur (Lucinda Russell/Derek Fox, 11st), who is 25/1 from 20/1. Elliott has 11 runners in the race, after Outlander (Richard Spencer/James Bowen, 11st 4lb) and Don Poli (Philip Kirby/Mr Patrick Mullins, 11st 3lb) were sold for £165,000 and £170,000 respectively at the Goffs UK Aintree Sale yesterday evening. Both horses are 80/1 shots for the Randox Health Grand National. The Pat Kelly-trained Mall Dini was ruled out of the race yesterday evening with a leg injury and his position in the 40-strong field was taken by James Moffat's Just A Par (Aidan Coleman, 10st 2lb), who is 100/1 to win the world's richest and greatest chase. Betway is paying out on the first six home for each-way purposes in this year's Randox Health Grand National (one fifth the odds). 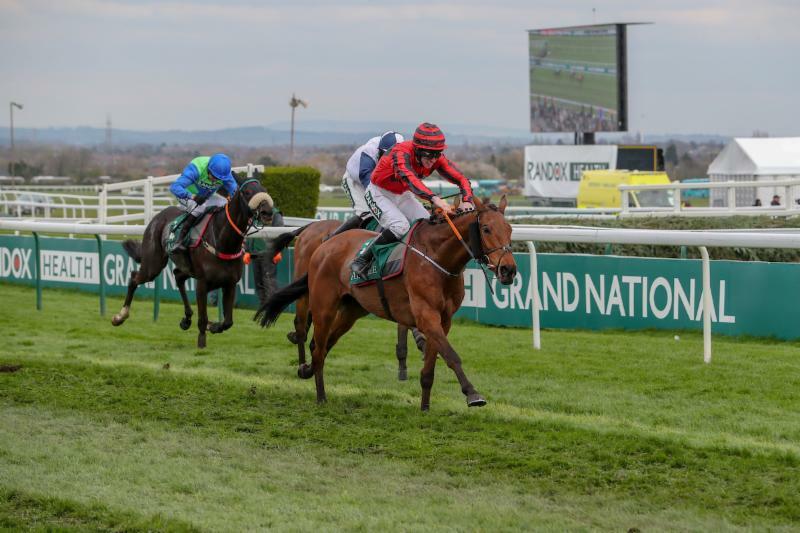 Lizzie Kelly, Rachael Blackmore, the injured Bryony Frost - those are the names of women jockeys expected to fill newspaper pages during this week's Randox Health Grand National Festival. Tabitha Worsley could have walked into Aintree's media centre at lunchtime yesterday and been largely unrecognised, but 24 hours on and she features heavily in the national racing press courtesy of a memorable victory on Top Wood in yesterday's Randox Health Foxhunters' Chase. She became just the fifth woman to win 'the amateurs' Grand National', with the result that her biggest rival for newspaper space today are sweepstake pages listing the 40 Randox Health Grand National runners. 'Ladies' Day comes early at Aintree' is The Times' headline below a photo of triumphant Worsley returning on her gallant mount, while 'Worsley is a winner after recovering from broken back' is a Daily Mail headline above a report by Marcus Townend, who writes: "Worsley, 24, had three metal rods and six pins inserted in her back after a fall in 2017, and still has the metalwork in place." Reflecting on her injuries, and a subsequent broken collarbone, Worsley tells Chris Cook of The Guardian, "It wasn't my year". She has bounced back better than ever, confounding a view held for many decades that women were not strong or brave enough for Jump racing. On that subject, Ross Clarke of The Daily Telegraph interviews the six women riders who have completed the Randox Health Grand National. They include Geraldine Rees, eighth on Cheers in 1982, and quoted by Clarke saying: "Society didn't expect us to be able to compete against men." A gutsy action shot of mud-spattered Worsley and her willing partner clearing a fence gives The Sun's racing pull-out a cover to savour. 'Girl's on top' is the headline, while The Daily Telegraph's Marcus Armytage column is headlined, 'Worsley's cool victory caps a day when women dominated. Other successful participants on day one were Jessica Harrington, Amy Murphy and Rachael Blackmore. Bryony Frost could not be among them due to a broken collarbone, but she makes for an absorbing interview with Jim White in the features section of The Daily Telegraph. 'Top Notch is the Racing Post's take on Top Wood's victory, while the Liverpool Echo carries a final-fence action shot of Worsley. 'Top Wood proves too good' is the Daily Express's take on the victory in a report which includes quotes from Aintree's clerk of the course, Andrew Tulloch, praising amateur riders who took part in the Randox Health Foxhunters' Chase. The ground was testing, but riders acted swiftly to pull up horses when their winning chance had gone. Blustery rain made conditions testing for racegoers, too, providing photographers with a wealth of opportunities to capture the British at their bedraggled best. The front page of The Times features a large photo of a smiling woman, with the caption - racegoers attending the first day of the Grand National meeting at Aintree refused to let the cold and rainy weather dampen their spirits. 'They're off . . . race fans are all of a flutter' is the Daily Express's page 3 headline above a selection of windswept shots, while the Daily Mail's montage of rain-poncho wearing racegoers is headed 'Welcome to Raintree!' The Daily Mirror's sub-editors use the same headline, while the Liverpool Echo's photos are headlined 'Rain fails to dampen the Aintree spirit'. The Sun opts for 'A bit windy at Raintree'. Today's racing involves four Grade One races plus the Randox Health Topham Chase. Politologue and Topofthegame could land two prizes, and both horses feature on the Racing Post's cover. 'Top of the World' is the paper's headline, while the Daily Mirror's 'Pol star' headline refers to Politologue's chance in the G1 JLT Chase, which he won last year. Politologue is the choice of Rob Wright of The Times, while 'Pretty Poli' is The Sun's view above a tipping piece by Templegate (Steve Jones). The Daily Star's Jason Heavey sides with Waiting Patiently, as does Jon Freeman in the i.
Pens are at the ready for a feast of Randox Health Grand National previews in tomorrow's press, but some journalists have trapped early - a Daily Star headline, 'The Party Girls are back', suggests an article on Aintree's bubbly racegoers, but Jason Heavey's piece centres on Belinda McClung and Deborah Thomson, the owners of One For Arthur. He won the race in 2017 and is back for a second try tomorrow. "I think we'd be partying forever!" Thomson tells Heavey when pondering a follow-up victory. Who could blame them?